Father is injured and he is in Jammu, said the five-year-old son of slain CRPF Head Constable Jaimal Singh, killed in Pulwama terrorist attack, as the child lit his pyre amid full state honors at his native village, Ghaloti Khurd, of Dharamkot sub-division in Moga district Saturday. Singh was the driver of the vehicle that was blown up in the attack. 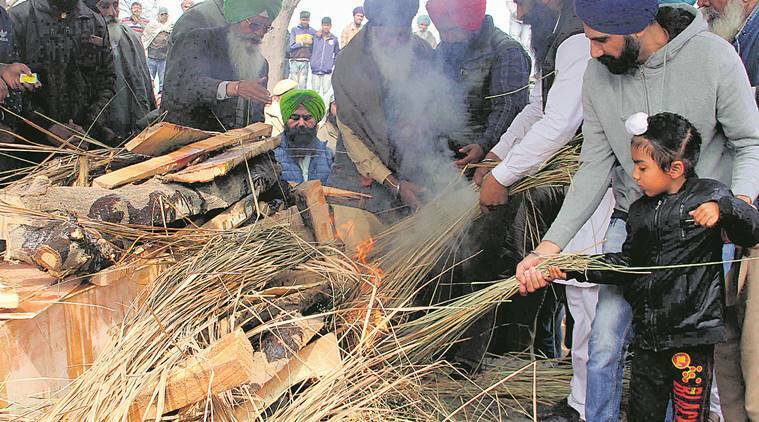 His five-year-old son, Gurparkash Singh, lit his pyre in presence of politicians, including those from the ruling Congress, Shiromani Akali Dal (SAD)and Aam Aadmi Party (AAP). The five-year-old, however, didn’t know whose last rites he was performing. “He is unwell and in Jammu. He has been hurt and cannot speak. Everyone is saying that now I cannot talk to him on phone, but he can see us. He can see me, so I should not cry,” said the little boy, as he along with his paternal uncle Naseeb Singh (Jaimal ’s younger brother) lit the pyre. Among the politicians who made a beeline at their residence Saturday were Union Minister for Food Processing Harsimrat Kaur Badal, her husband and former deputy chief minister of Punjab, Sukhbir Singh Badal of SAD. First, Sukhbir came to visit the family and left. Later cremation was attended by his wife. Also present was senior SAD leader Tota Singh, the former Dharamkot MLA. The seat has been a stronghold of the Akalis, but current Dharamkot MLA is Kaka Sukhjit Singh Lohgarh from the Congress who was also present. Apart from local Moga MLAs of the Congress, including Lohgarh, Harjot Kamal and Baghapurana MLA Darshan Singh Brar, Punjab Cabinet minister Navjot Singh Sidhu, facing flak for his alleged remarks on Pulwama attack, came to meet the family later in the evening. AAP state president Bhagwant Mann and local Lok Sabha MP Sadhu Singh from Faridkot also came to meet the family. Mann said that as an opposition party, AAP is standing with the government at this time of grief. “We will stand by whatever decision the government will take to give a befitting reply. It is time to keep aside all our political differences. We are with the Indian Army. Our army, which is well-equipped and capable, will give such a befitting reply that coming generations of these enemies will remember it,” he said, however adding that Rs 12 lakh compensation announced by Punjab government is not enough and they should be given at least Rs 1 crore as being given by Delhi government, led by Arvind Kejriwal. “Rs 12 lakh is nothing in today’s times to run a family. They should be given at least Rs 1 crore per family as being given by Delhi government. Though money can never compensate for lives, it is required so that they do not face any financial problem,” he said. He added that AAP MP Sadhu Singh will also spare funds from his MPLAD fund for a memorial or library in memory of Jaimal. He also criticised former AAP leader and now president of Punjabi Ekta Party Sukhpal Singh Khaira for his alleged comments on social media. Mann also criticised Cabinet minister Navjot Singh Sidhu for his alleged comments on Pakistan and said “some people should leave their friendship when our jawans can sacrifice everything for us”. “Sidhu needs to choose between country and friendship. If soldiers can sacrifice their everything for our safety, then why can’t we leave our friendships and convenience…,” he said. 1 Village debates: do we tell visiting leaders of issues?